I used to teach a class in Philadelphia called Yoga Sculpt. I didn’t create it, but took it over for someone else and having always been a gym rat, it quickly became one of my favorite classes to teach. Yoga sculpt incorporates 2-10 lb. hand weights in to your yoga practice which can help make your practice more dynamic, add a different challenge as well as a cardio component. You tend to find Yoga Sculpt classes more in a gym setting as opposed to your yoga studio. I won’t claim that it will “deepen” your yoga practice, but it will certainly spice things up a bit. From a business perspective if you’re an instructor looking to set your self apart from the growing market, or looking to teach more of a Bootcamp style class, Yoga Sculpt could give you that extra edge. 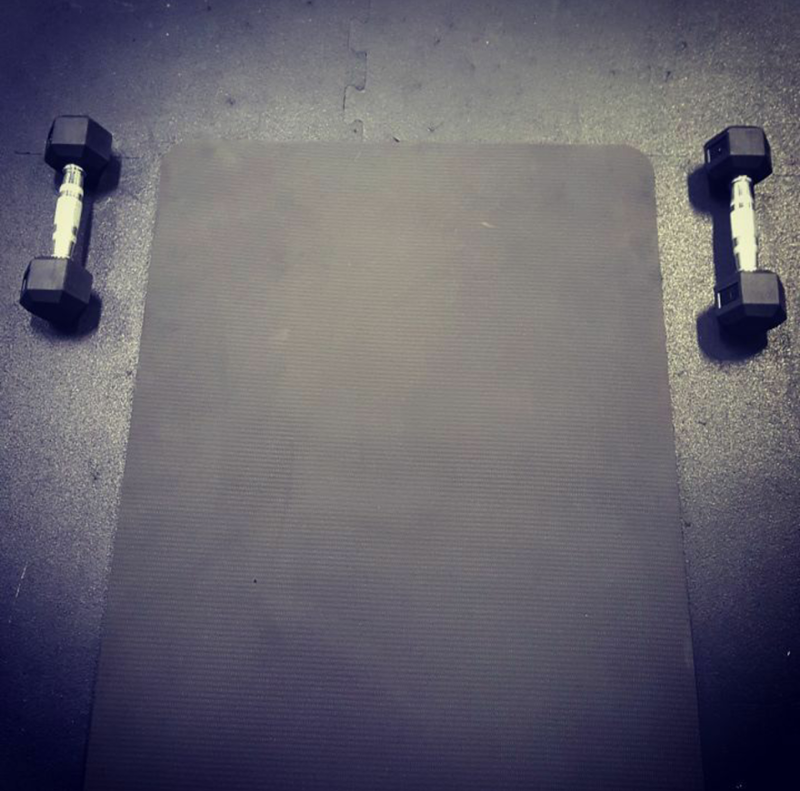 Grab 2 sets of weights – 1 heavy and 1 light for example a 3 lb. and a 5 lb. set or a 5 lb. and 8 lb. set. You may want to go heavier for something like rows or bicep curls and lighter for triceps kickbacks or flys. Set them at the top, outside of your mat. This way they are there when you want them. I always start my practice by warming up with Sun Salutations. What you’ll find is when you start adding in the weights and doing sets, you’ll quickly realize how often you can incorporate the weights in. It’s simply a matter of being creative. The first couple of times I suggest having a journal on hand so you can write down what you did and even create some sequences. You’ll be able to feel in your body what worked well and what could have been better. Use the weights as naturally as possible so the transitions become seamless and less awkward. This will come with practice and time. If you’re looking to teach Yoga Sculpt I suggest saying the words out loud as you practice this way you can hear how it sounds. Dive right in, go with the flow and see where your practice takes you! In warm up – weight in hand while reaching right arm forward and left leg back then curling in to touch elbow to knee. Bend your knees, take hold of your weights, sweep your arms up Utkatasana Shoulder presses (goal post arms, elbows in line with shoulders). Bicep Curls in Crescent Lunge. Bicep Curls in Warrior 2. Triceps kickbacks in Crescent Lunge with torso lowered 45 degrees. In Side Angle keep 1 forearm on the thigh. The arm that would normally be diagonal has the weight. Curl your body down, drop the weighted arm down towards the floor (like you’re going to set the weight down next to your front foot), then open your chest as you lift the weight up toward your armpit, then finally extend the arm straight up into the sky as you look up toward the weighted hand. Lower the weight back down to your chest then back to floor. I realize this sounds confusing. I’ll try to post some photos soon! Plank Rows – in plank with weight in both hands, pull right arm up, then left, alternating. Side Planks with weight in top hand – bending at elbow, lifting & lowering weight towards chest or curling weighted arm all the way under body working obliques. In Warrior 2, bend at elbows then straighten arms back out. There are a couple ways to do this. Try it in your body and see what you like. In Goddess, reach arms out with palms facing up while knees are bent, straighten legs while bending elbows pulling arms in. You can also add pulses in Goddess for that extra burn! You can even simply hold the weights as you move from Warrior 1 to Warrior 2, Reverse, etc. adding them into your flow in addition to doing sets of reps.
Use the weights like you would for blocks to lift up in Uth Pluthi. When I’m just lifting weights, I lift heavy, but for Yoga Sculpt I tend to go lighter for injury prevention. I strained my Supraspinatus a while back (one of the Rotator Cuff muscles) so I need to be careful, particularly in overhead movements. You’ll notice more fatigue adding even light weights in to your practice, so use caution, go easy and don’t over do it. When I’m doing a sets of reps I do 10 and count down backwards – more of a work out style of counting. As you can see, there’s so many options! Try different things out. Make it yours! Have you ever done Yoga Sculpt? Share your favorite moves!